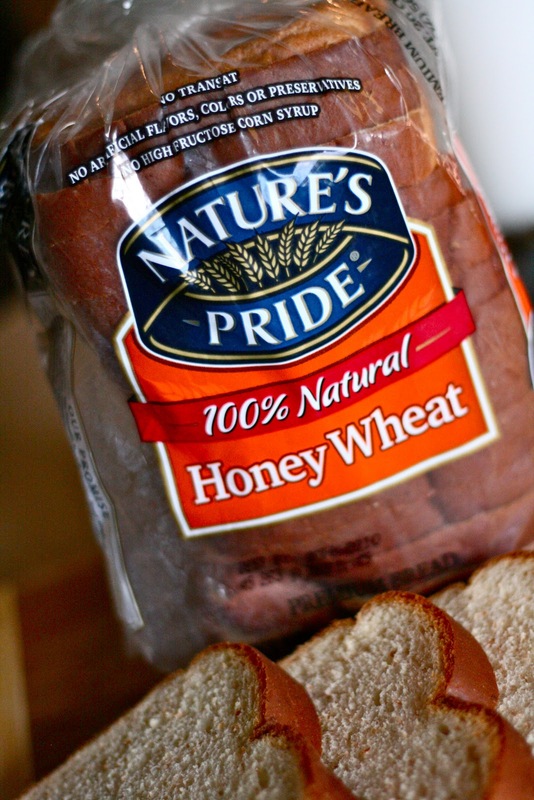 Nature’s Pride Bread is a 100% Natural bread: no artificial preservatives & no high fructose corn syrup… absolutely delicious (you can taste it in every bite!). Note: The hubs get credit for helping me with this one… these are some of his favorite flavors combined! Preheat oven to 375-400 and Bake Plantains according to box instructions (I usually let them go longer to make sure they really caramelize). When done, set aside and allow to cool enough to handle with your hands. Coarsely Chop and set aside until ready to use. Take the slices of Nature's Pride bread and cut circles out of them with a cookie cutter or other round object. Using a rolling pin, roll the rounds flat. Spray a Muffin tin with Pam and carefully press the flattened bread round into the cups (folding the edges slightly to allow them to fit). Spray the tops of the bread and place into the oven, at 375 degrees, and bake for 12-15 minutes. Keep an eye on them so they don't burn. Remove from oven when golden brown and set aside. While the Bread Rounds are in the oven, heat the BBQ sauce in a skillet. Add the Vinegar, Cayenne, and crushed red pepper. Mix well and heat until bubbling. Turn heat to low and set aside. Last for the prep work: Remove the Rind from the Brie and coarsely chop into small pieces. The rind is edible, but I prefer to remove it because its chewy and not as tasty as the creamy goodness inside. Add BBQ Sauce to the Chicken (reserving 1/3 cup for drizzling). Mix well and add Salt & Pepper to taste. 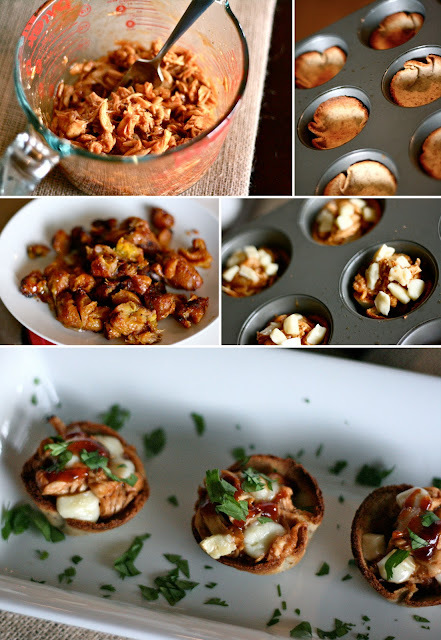 Set up assembly Line: Toasted Bread Cups, Chopped Cooked Plantains, BBQ Shredded Chicken, and Coarsely Chopped Brie Cheese. Add a small amount of the chopped Plantains in the bottom of the toast cups. 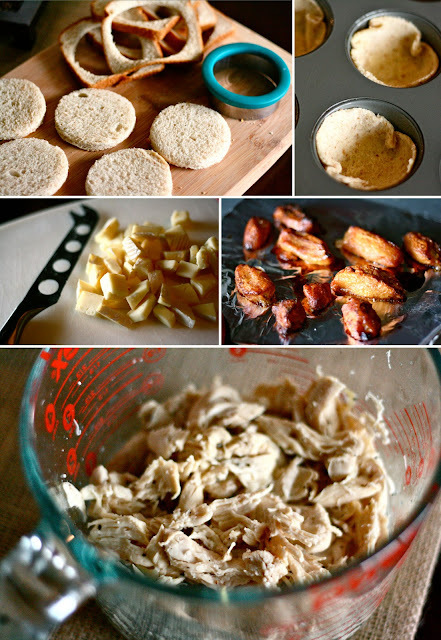 Top with a rounded tsp of the chicken mixture, and then sprinkle with the brie cheese pieces. Place in the oven and Broil for just a few minutes (keeping an eye on them), remove as soon as cheese has softened and melted. Carefully remove the little treats from the cupcake tin (I used two forks) and place on serving platter. Drizzle with additional BBQ sauce and sprinkle with Chopped cilantro. Serve while hot. The flavor combo is killer – Sweet Plantains, Smokey Spicy BBQ, Creamy Brie, Perfectly Crisp Bread Cup = Party in your mouth. Enjoy! The hubs scarfed these down immediately. These are so adorable, and so creative! I did something very similar (bacon, egg and toast cups) a few months ago, and these remind me so much of those! Thanks for the idea! Those look incredible. If I were to make these, I think people would go crazy for them. ok, these look SOOOO YUMMM! Looks and sounds like a winner to me. My sister in Ireland made this….and got rav reviews! !